With 116 islands, Seychelles offers an abundance of attractions for tourists all year round, including beautiful beaches, a variety of cultures and many endemic animal species. You can’t help but fall in love with these islands. Seychelles was colonised by Britain in the early 19th century. In 1976 Seychelles became an independent republic after about 200 years of colonial rule by Europe. The Clocktower, or Lorloz, as it is known in the native language, is a very important landmark in the very small capital of Victoria. The Clocktower has remained virtually unchanged for the past 100 years and remains a very important focal point. The clock is a small version of one erected in London in 1897. The clock was ordered by the governor at the time, Sir Ernest Sweet-Escott, as a memorial to Queen Victoria of England who died in 1901. The clock can be seen from the road and nearby stalls and shops in the Victoria, and chimes on the hour. 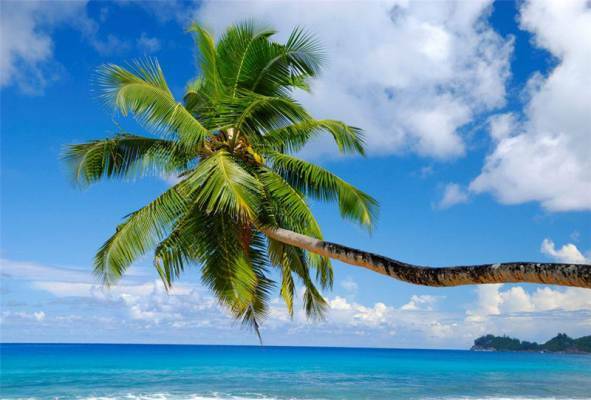 The Coco de Mer is a type of palm tree that can only be found in Seychelles. The tree holds three botanical world records: the mature seed can weigh up to 17.6kg, and is the world’s heaviest; the largest ever recorded fruit weighed in at 42kg;and the female flowers are the largest of any palm. Before the Seychelles Islands were populated, the nut of the Coco de Mer tree would be carried by the currents to the East. People who found the nut on the sea shore believed it grew on a mythical tree at the bottom of the ocean. European nobles in the 1500s polished shards of the shell and used them for jewellery. Breath taking marine life can be found between the coral reefs surrounding the granite boulders. With so many coral reefs in Seychelles you can meet some of the most playful fish like the Bat Fish, Butterfly Fish and the Parrot Fish that looks like it’s always happy to see you. Turtle species include the Hawksbill Turtle and the Green Turtle. Near the granite boulders you can expect to see Eagle Rays, giant Sting Rays and even the occasional dolphin. If snorkelling at night is your preference you might see some shrimp, crabs and Spiny Lobsters. The famous wreck of the Ennerdale can be explored and is home to Scorpion Fish, Lion Fish, Barracudas, Giant Cod, Eels and Sting Rays. The largest land-living arthropod can be found in Seychelles. The Coconut Crab can weigh up to 4.1kg and grow 1m from leg-to-leg. The crab can be found mostly on land since it cannot swim and will drown when immersed in water for too long. The crab got its name from climbing coconut palm trees and dropping the nut to the ground where it would crack open. The crab then also falls out of the tree and eats the flesh on the inside. These crabs can be seen all over the Seychelles Islands and are truly a spectacular sight. The Jellyfish Tree is endemic to the island of Mahè and got its name from the jellyfish-like shape of the flowers. This critically endangered species was thought tobe extinct until a few trees were found on the high granite slopes in the 1970s. The tree has been named the loneliest tree in the world; there is no other plant remotely related to this tree in the entire world. It is the only tree in this genus or family and there are only 90 left and they are all scattered over three hilltops on Mahè Island.